The market for chimeric antigen receptor (CAR) T-cell therapy is projected to be valued at almost $300 million by the end of 2018, and this number is expected to grow annually by 32% for the next decade. This method of cell therapy shows promise in treating hundreds of people ages five to 45 with Hodgkin lymphoma and non-Hodgkin lymphoma each year. Scientists are advancing the approach to treat other cancers and to target solid tumors. T-cells are a type of white blood cell. CAR T-cell therapy involves extracting a patient’s T-cells from their blood. The patient’s T-cells are then engineered to attack cancer cells by adding chimeric antigen receptors, and the engineered T-cells are injected back into the patient. Because this therapy is specific to each patient, the entire process is time intensive. Execution time for the therapy is currently longer than desired, affording time for the patient’s cancer cells to mutate and shed the target molecule. As a result, T-cells that were engineered to target a specific biomarker can no longer effectively attack the cancer cells. Cell therapy researchers are attempting to overcome this hurdle by expanding the biomarkers that T-cell therapy targets. Biomarkers indicate disease, infection, and other phenomena, helping clinicians and researchers diagnose and treat patients. New biomarkers expand options for diagnostic testing in early stages and/or diversify the therapy to allow more than one receptor on the cancer cell to be targeted. Biomarker discovery has the potential to improve patient outcomes. However, it is limited because biomarkers can be specific to each patient or a certain type of cancer. This specificity limits the relevancy and effectiveness of treatments to only a small segment of the population. CD19, which is highly expressed on malignant B-cells, is the most widely used biomarker and target molecule. It has already shown promise in the CAR T-cell therapy drugs, Yescarta and Kymriah. Both drugs are approved by the U.S. Food and Drug Administration (FDA) and are widely used to treat patients with a slim chance of complete recovery using other treatments, such as stem cell transplant, chemotherapy, and radiation. ▲ Chimeric antigen receptor (CAR) T-cell therapy uses T-cells gathered from the patient’s own blood. 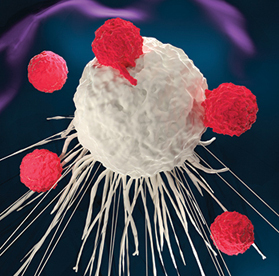 The T-cells are engineered and then infused back into the patient to target and attack cancer cells. Treatment methods such as chemotherapy and radiation can do more harm than good for patients with already unstable health. Side effects of CAR T-cell therapies have been shown to be minimal or reversible, making it one of the safest available treatment methods. Scientists at the Fred Hutchinson Cancer Research Center have taken a deeper dive into understanding and minimizing the toxic side effects of CAR T-cell therapy. Cameron Turtle et al. studied disruptions to the blood-brain barrier (BBB) in patients who developed neurotoxicity from CD19 CAR T-cell therapy. After chemotherapy treatment followed by CD19 CAR T-cell therapy, patients exhibited symptoms of neurotoxicity and a highly permeable BBB. Increased permeability of the BBB makes the brain vulnerable to harmful molecules. Cytokine release syndrome (CRS) caused the neurotoxicity. In CRS, the infusion of T-cells causes the immune system to go into overdrive, triggering T-cells to release enormous amounts of cytokines. In addition to neurotoxicity, CRS can cause headaches, nausea, hypotension, and other symptoms. Scientists, clinicians, and engineers are in a race to find the next therapy to progress to clinical trials. Although CAR T-cell therapy is generally thought to be safe, the negative side effects and long lead times beg for improvement. Pharmaceutical companies will need to lower production costs for more affordable therapy and improve the turnaround time from blood draw to infusion. Current therapies on the market cost a minimum of $373,000 per patient. Not all insurance policies cover T-cell therapy and a limited number of patients can afford it. The scientific community will have to work together to overcome these challenges to deliver safe and effective treatments to the people that need them. Read “Pharmaceutical Manufacturing: Current Trends and What’s Next,” pp. 23–29, to learn more about the ongoing efforts to reduce the cost of therapies.